This Kemper Performance re-creates the guitar tones from the song ‘Tremble’ as recorded by Mosaic MSC. It is designed to be used with the Kemper Remote, and all effects are included in the Kemper. 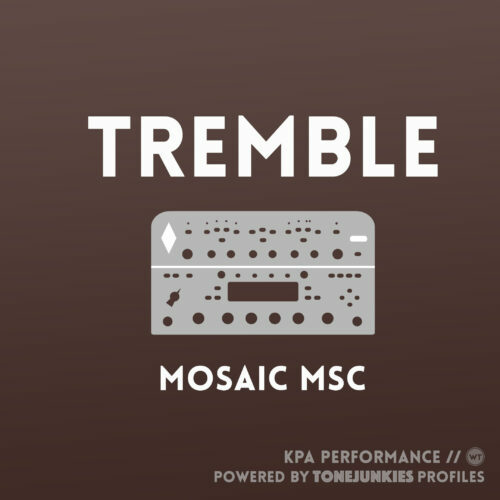 This Kemper Performance file re-creates the guitar tones from the song ‘Tremble’ as recorded by Mosaic MSC. It is designed to be used with the Kemper Remote, and all effects are included in the Kemper. The profile used in the Kemper is an ‘Empire’ profile from Tone Junkies – this is a premium profile from their Empire pack. It is a profile of the Tone King Imperial amp. Tone Junkies makes incredible profiles of many amps – you can see their full line-up here. We’ve set up the different song sections in the different slots on the remote (Rig Buttons 1-5), and we’ve mapped effects that you’ll likely want to access on the effects buttons (Effects Buttons 1-4). You can map these various effects to the effects 1-4 buttons on your KPA Remote as desired. We tested this performance with multiple guitars, but ultimately you may want to tweak it a bit for your guitar, which will most likely have a different output level and pickup tone than our guitars. These two controls have an enormous impact on the overall tone, and are very efficient at adjusting the gain structure and clarity/tone of the sound, all without straying too far away from the base tone. They’re perfect for tailoring a patch made with humbuckers to a single coil guitar (or vice versa). We always recommend starting here rather than EQ or Gain controls. EQ Controls:From there, adjust the EQ controls (in the amp stack). If the tone is a bit dark or bright, adjust the EQ to compensate. Gain control (proceed with caution). We recommend adjusting the gain on the amp last – especially raising the gain. This will introduce digital gain, which sounds pretty gross – it does not behave like a gain knob on an amp. If you need more gain, either adjust the definition control or increase the level control on the compressor. If you need less gain, turn the gain control down works well.